Nicholas Gilman is a food journalist based in Mexico City since 1998 - he is author of Good Food in Mexico CIty: A Guide to Food Stalls, Fondas and Fine Dining. 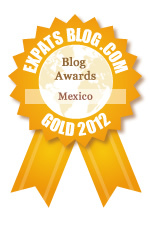 ExpatsBlog.com Expat Blog Awards 2012: Mexico Gold Award! This blog won the Gold Award for best expat blog in Mexico! This blog is one of the best resources for anybody who wants to eat "good food in Mexico City". It's not just the name, but it's author is a great eater and tries every little stand or large restaurant to find the best places to eat in the city. I entirely trust his advice. Good Food In Mexico is a knowledgeable, humorous and helpful guide for navigating the very variable and often changing Mexico City dining options. This blog has the most incisive insights into the amazing food world of Mexico City. I can't imagine any foodie looking for culinary gems in this big city not finding an endless source of delight with this blog. fouillÃ©, efficace, juste, et comme dirait ma grand-mÃ¨re, "simple et de bon goÃ»t"; ma rÃ©fÃ©rence! olivier dekeyser, pÃ¢tissier. My wife and I love Good Food in Mexico City! Not only is it entertaining and educational just to read, but we use the recommendations to check out great places to eat and shop for food in Mexico City that we wouldn't have known about otherwise. Kudos to Nick Gilman for doing the grueling groundwork that makes it easy for Chilango food lovers. Great recommendations on food in Mexico City. From fancy restaurants to street stalls, Nick is spot on. I've been to many of the places he reviews & have discovered new favorite haunts thanks to him. This is the one and only go-to blog for people interested in the cuisine of Mexico. There are lots of other Mexican foodie blogs, but this is the one I always find most well-written, most informative, and most authoritative. The best resource for keeping current with restaurants, market stalls, street carts, taco stands and other great dining in Mexico City!! We started visiting Mexico City a few years ago, and have used Nick's book as our Bible ever since. It's a great resources and has NEVER let us down! Well done! One word of warning, son't read this blog at lunchtime. We have been living in Mexico for two years and we cherish the Good Food in Mexico Blog. It is an never ending guide to fantastic food discoveries, it is a pleasure to read, the author writes very well, every new entry stimulates your curiosity and certainly wets your appetite. It offers a delicious variety of foods, wether a food stall at a street corner, a fine expensive restaurant or a typical fonda. We love it. We have never been disappointed and I can tell you our visiting friends from the U.S. and from Europe love it too. We send them the link to the blog before their arrival and thus create high expectations for Mexican culinary experiences. No disappointment so far! BRAVO! Nick takes you high and low to find the the best. The blog is fun, informative and generous. Don't mess with Nick Gilman. Good Food in Mexico City is always interesting, informative, insightful, colorful and captures the essence of GREAT Mexican cuisine, ingredients and history. Reading it is the next best thing to being there, and you can really taste and smell the great food and enjoy the ambiance of every place he visits and describes through his delightful writing! Some of the best, honest and inviting reviews out there. It gives you the perfect tools to make the best informative decision when considering where to eat great in an enormous city!. But what gives the blog 5 stars is its fun, fluent personality, and the fact that it guides you through Mexican Cuisine, from taquerÃ­as and fondas to tasting menus and highend hotspots in a language that everyone gets. Bravo! Great guide to help you navigate the Mexico City food word. Nicks descriptive posts tempt me to get on a flight to DF immediately and try out his newest discoveries! Nick is well-informed and constantly looking for new and unusual places to eat in this city that is impossible to conquer in one lifetime. HereÂ´s someone who spends his time searching for the best spots to eat, while writing in a lively fashion about it. Not only that, he gives you the gamut of possibilities: from the hottest new restaurant in town to the best tacos or pulque in some far off neighborhood. An insiderÂ´s view of Mexico City. Nick Gilman is witty and discerning; whether you live in the DF or are visiting, his blog is a wonderful guide to dining, eating, chowing, slurping, and downing. you can't eat in mexico city without nick gilman's "good food in mexico city"! grab a huarache on the street corner or dine alta cocina, this books satisfies all your culinary temptations. a day doesn't go by when nick is searching for the latest and greatest eats in this city. this book is a must! There is no question that Nick Gilman's blog (and book btw) is the very best source for the very best food that Mexico City has to offer. He gives information, description and opinion and is not shy about giving constructive criticism. He also gives suggestions about the place, neighborhood, etc. - this is hugely useful. I cannot think of any reason that his blog "Good Food in Mexico City" should not win your Expats in Mexico Blog Award! Simply my favorite reference book and blog for Mexico City. Nick really knows what he is talking about and he is a real gourmet, a curious and open-minded critic. Outstanding blog. Nick's comments are always spot on, entertaining and thought provoking. His broad culture and culinary knowledge makes for an exceptional food critic blog. I continue to enjoy every new discovery.